I am currently chatting in an IRC and there is one girl (i think she's about 18 years old) and she has Asperger syndrome and therefore is unable to understand countenance and feelings. She told me that she only knows of happiness, sadness and rage but doesn't really understand what each means. Furthermore the other people use emoticons like :), :(, >:[, ^^, ... and she really has problems to follow the discussion because she is really confused about all of this and when I tell her what each emoticon means five minutes later she will not be able to distinguish between these. First question, how deep is your knowledge about autism and Asperger Syndrome? Do you understand how autistic people think? Do you understand, what this girl have meant, when she have written, she doesn't really understand what each means? For neurotypical person, a typical use-case for I understand you phrase is I know what you feel. But autistic people by understand mean in the first line to know the cause-and-effect. So your friend saying she don't understand what really each emotion means, could as good mean: I don't know how particular emotions are affecting the meaning of words the given person use. If you want to explain emoticons to her, you should IMHO in first line explain, how particular emoticon in modifying the meaning of the sentence. So, think of emiticons not as the way to communicate emotions (which is of low importance to autistic people) but as the modifiers that change the meaning of the sentence or of the particular words. I'd like to expand on volkerjaan's answer. I am Asperger myself. I know what :-), ;-) and ;-( mean (though I know ^^ only as see above). I don't necessarily understand when people are using them. I do understand their origins, and I suspect that is what the question boils down to. To follow the conversation, it is not needed to understand the meaning. It is enough to know the meaning. In my interpretation, understanding is related to why. As an Asperger, the ability for abstraction is often different from those in neurotypicals. So I would explain it as follows. This represents a face in an abstract way. The face is happy, because the edges of the mouth are turned upward. Of course, a real face looks very different. However, this is an abstract representation of a happy face. For an unhappy face, the edges of the mouth would go down. When we are on IRC, or in another text-only medium, we do not use pictures. Therefore, we need to make drawings in a different way. One way to make drawings on IRC is by using characters normally used for other things. This is what we do when we use emoticons. A emoticon is a sideways drawing of a face. To see it in the correct orientation, turn your head to the left, so that you see the : or the ; on top, the - in the middle and the ) or ( at the bottom. In :-), when turned side-ways, we see three parts: first the :, then the -, and finally the ). The : represents the eyes. They are two black dots (depending on your viewer) like in the picture of the smiley below. Finally, the ) represents the mouth. Like in the smiley above, the edges of the mouth are turned upward. This means happy. 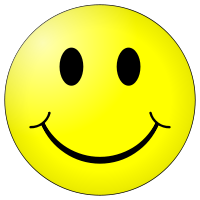 The ( in this smiley represents again the mouth, but now the edges of the mouth are turned downward. This is a representation of being sad. The third emoticon is ;-). It is again similar to the first one, :-), but now the first character is different. Remember how : represented the eyes. In this case, ; represents the eyes, but with a wink. The ; consists of something that looks like . and something that looks like ,. The . is the open eye and the , represents the closed eye. This is strange: why is the closed eye larger than the open eye? It should be the other way around! Yes, it should. Even if it is wrong, people use ; when they mean: two eyes, one of the two is closed. When one of the two eyes is closed, it is a wink. People use the wink when they mean I am joking. There are many other emoticons, but those are the most used ones. There is a list on Wikipedia. This lists the meanings, but it does not explain any of them. I don't know if there is a website anywhere with explanations. Sometimes, you just need to accept what it means, without understanding them. But I hope that my description above explains the most common ones. The most succint way to explain emoticons is that they are an expression of informal rating on a person's recent comments. :) represents, as Omoe said, a informal expression of pleasure at something which has just been expressed. :( a contextual informal 'unhappiness'. Emoticons are just 'up-votes' and 'down-votes'. They have nothing to do with real emotions. There is a good reason that people prior to the advent of Internet 'talk' and 'chat' wrote real sentences.. their words cost something to put on paper. They were meaningful. A modifier meaning that someone is happy or want to relieve. I was a really nice day :). Don't worry, you will pass the exam :). A modifier that someone is sad or wants to say sorry. ...and then I spilt all milk :(. I couldn't do it for you :(. A modifier saying that someone is joking or laughing, or to not take something serious. Warning: sometimes it can mean that someone makes an ironic comment. (I'm not sure if I get it right, since it's less common) - excited, surprised, astonished, flirting. I met this cute guy ^^. They announced the winners and, guess what, they read my name ^^. Not the answer you're looking for? Browse other questions tagged autism communication aspergers or ask your own question.